Welcome to Two Island, the next stop on your tour of the Sevii Islands. There's not much to do here as on One Island, so take a look around and get ready to head out. Two Island contains a Pokémon Center, a few houses, and a small market. As the vendor just moved from Kanto, his inventory is quite limited, carrying only Great Balls and Fresh Water for now. His market has a lot of potential, though. As you advance further in the game, the vendor will expand his inventory, including certain items that are not usually available in Kanto. If you head north, you'll hit Cape Brink, but that section is covered later. Unfortunately, unlike One Island, the seas here are too rough to Surf or fish in, so there are no Pokemon to catch here. To the right of the Game Corner is a Move Relearner, who in exchange for two Tiny Mushrooms or one Big Mushroom, will teach a Pokémon a move it learned at a lower level. This can allow Pokémon to learn (or relearn) moves that would have been attained at lower levels, (Such as Charizard learning Heat Wave at Level 1). You can obtain these mushrooms from caught Paras or Parasect. 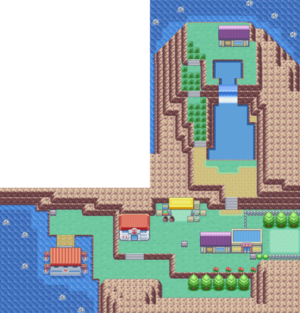 Now that you've visited two Pokémon Centers in the Sevii Islands, you can Fly between them instead of taking the boat. Head over to the Game Corner on the southeast side. A Biker will enter who mentions he's looking for his friends, and heads off. The owner, Celio's friend, will beg you to find his daughter Lostelle, who is late with his lunch. Head over to Three Island to find out what's happened. Pokemon Jump: You and another player must choose a small Pokemon capable to jump. Both Pokemon will then jump a Venusaur's Vine Whip and try to keep up with the other. The Pokemon with most points wins. Dodrio Berry Picking: You must have a Dodrio with you to play this game. Three to five players will use their Dodrios to catch as many Purple Berries as possible, while avoiding the Green ones. The winning player may be awarded rare Berries, depending on his/her score. Revive: Use Cut on the path below the Pokemon Center. This page was last edited on 11 December 2017, at 02:37. This page has been accessed 276,874 times.